According to GraduatePrograms.com, the graduate education experience offered by KSU’s Political Science department is among the best in the country. 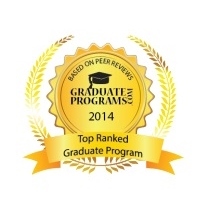 The GraduatePrograms.com website surveys recent and current graduate students on the quality and value of their graduate education, and then evaluates programs across fifteen categories. Overall, the graduate programs housed in KSU’s Department of Political Science were ranked the 13th best in the country. We had good company in this ranking — sandwiched between Harvard University (ranked 12th) and Yale University (ranked 14th). KSU’s graduate programs were ranked #1 in the country for both career support and faculty support. Wow, congratulations! I did not know this. I plan to feature this in a upcoming newsletter I send monthly to state elected officials. Thank you Sue — for all that you do! Congratulations! Proud to be a K-State Pol. Sc. alum.! Thank you Vivienne. Your support of the Douglas Scholarship helps tremendously! Congratulations to all involved in this achievement!